Want a quick and delicious snack? 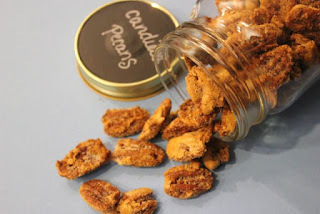 You can make these sweet candied pecans in no time. 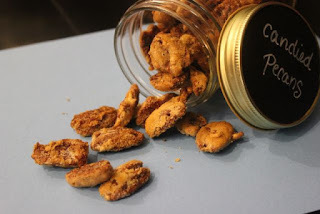 You could easily substitute walnuts for the pecans or even create a mixture. I like to just pop them in my mouth and savor the sweetness or sprinkle them on a salad for a little extra glamour. In a medium bowl, whisk the egg white until it is foamy and no liquid remains (you can use an electric mixer if you don't need the arm work out). Fold in the pecans and the brown sugar. Mix until the pecans are evenly coated. Spread the coated nut mixture on a greased baking sheet. Bake for about 13 minutes or until coating is cooked and golden brown.